If you're looking for a way to boost your diet with some healthy eating and drinking, and you've already checked out the best blenders for your juicing craze, then it might be a good idea to take the next step and try "Kombucha" tea. Kombucha is a highly popular fermented tea that's made from sugar and black tea. It's brimming with enzymes, minerals, and vitamins that are great for your body, and over the years, has been prized for its healing properties. Kombucha uses something called "SCOBY", a colony of yeast and bacteria that makes it a nutrient-rich beverage. The process of fermentation for the tea can take up to 12 days, depending on the process you use. Although in the past, Kombucha was a very obscure drink, it has quickly emerged as a popular solution for those seeking better wellness. Available in a range of different grocery stores and health food stores, you can either buy Kombucha directly or brew it yourself using strategies that you can find online. Kombucha is attributed with a number of fantastic health benefits. For instance, the nutrients that Kombucha contains are fantastic when it comes to supporting the body in a host of different ways. Studies surrounding Kombucha at this time are somewhat lacking, but the anecdotal evidence is significant. Here are just some of the ways that Kombucha may be able to improve your health. Although scientists aren't entirely sure why Kombucha is so effective at improving digestion, we do know that this substance is rich in beneficial acids, enzymes, and probiotics which are essential to maintaining proper gut health. According to Harvard Medical School, a healthy stomach is brimming with about 100 trillion different microorganisms. This means that we need plenty of good bacteria to survive. Drinks like Kombucha, that contain beneficial bacteria for your gut, could help to ensure that your microbiome remains in balance, so you're less likely to suffer from stomach problems. Of course, this is all relevant to your overall gut health, so if you’re experiencing serious digestive issues, it may be beneficial to speak to a healthcare professional to see if this can in fact be a solution for you. We constantly expose ourselves to a range of toxins almost every day, which can have a significantly negative effect on the body, often resulting in fatigue or general unwellness. The liver is one of the most important organs of detoxification in the body. 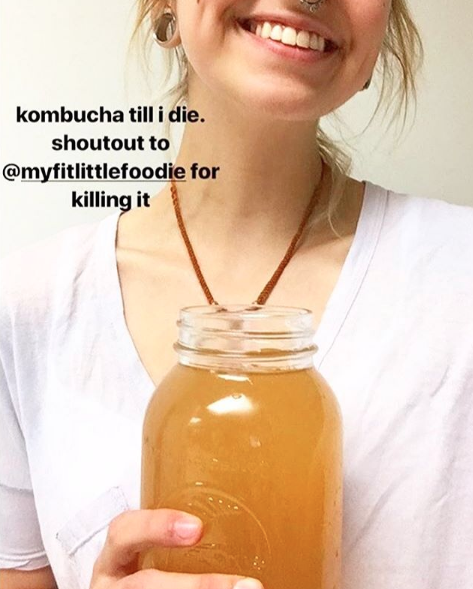 Fortunately, Kombucha is a substance brimming with Glucaric acid, which is great for the liver and natural detoxification. Kombucha also promotes better digestion with the healthy gut bacteria we mentioned above, which means that you can have an easier time processing food and enjoying more energy every day without having to resort to sugar and caffeine. Our immune systems are essential for keeping us healthy. Fortunately, Kombucha is naturally rich in antioxidants, which means that it's great for supporting the immune system. While there's no magic bullet available when it comes to enhancing immune system function, it's always a good idea to do everything you can to improve the immune process. Kombucha is brimming with a substance that's called DSL, or D-Saccharic Acid Lactone. This substance has fantastic antioxidant properties, and it's not present in any other unfermented teas, although there are plenty of teas out there that are rich in other types of antioxidant. Kombucha is also a great substance to drink if you're one of the many people who suffer from problems with arthritis and joint health. Kombucha fermented tea is full of a compound called glucosamine, which is great for improving the health of your joints, and reducing the pain you might experience due to stiff joints. Glucosamines are perfect for naturally increasing the level of hyaluronic acid you have in your body, which helps to lubricate and protect the joints. In some studies, this substance has even been shown to provide better, or similar relief as over-the-counter painkillers. If you're sick of piling on the pounds because of all the sugar-laden drinks you consume such as soda, then it's a good idea to turn to Kombucha instead. The substance is naturally carbonated as a result of the fermentation process, unlike sodas which are artificially carbonated through a process of forced carbonation. This fizzy tea can, therefore, be a natural and familiar alternative to other carbonated beverages, great for providing nutrients and probiotics that might not otherwise be available in soda. Plus, Kombucha contains less sugar than most soft drinks, because the sugar is consumed by the beneficial bacteria. Available in many different flavours, kombucha is also a tasteful and healthy addition to your favourite cocktails! But, we all know it is just perfect as a stand alone beverage!